When it comes to investing, one of the best things you can do for yourself is to invest in mutual funds. Mutual funds provide you with instant diversity. When you have limited means, it can make sense to choose a couple of mutual funds that can help you reach your desired asset allocation without a great deal of risk. However, you do need to be careful. One of the biggest ways that your wealth is eroded is through fees. Mutual funds can have a number of fees, and some of the worst are load fees. As you choose your investments, do your best to steer clear of funds that have a sales load and pick no load mutual funds instead. What is a Sales Load? Some mutual funds come with sales loads. These are fees that are charged when you buy or sell shares. Front end load fees are charged when you buy, and back end load fees are charged when you sell. On the front end, these fees are usually taken out of the total amount that you are going to invest, so you actually end up investing less than you thought. With a back end load, your earnings are reduced by the fee that is paid. In some cases, the back end load is only charged if you sell the mutual fund within a certain time period. If you hold your shares long enough, you might not have to worry about a back end. But if your mutual fund comes with a front end load, then there is usually no escaping it. 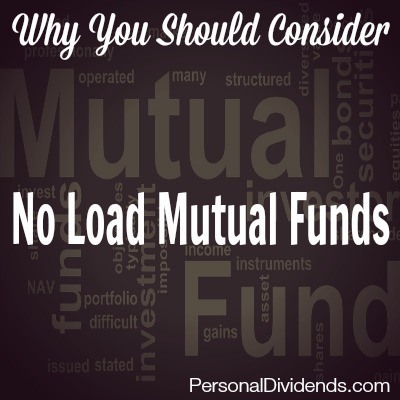 In reality, there is no reason to invest in mutual funds that come with load fees. The sales loads don’t really do anything to enhance your investment returns; rather, they erode your returns. As you choose mutual funds, look for no load mutual funds. Most brokerages have a selection of no load funds to choose from. This makes it a little easier to avoid paying the extra load fees. Of course, just because you don’t have to worry about sales loads, it doesn’t mean that you are home free with your mutual funds. You might still have to pay fees. There are always expense ratios to pay (lower your expense ratios by choosing index funds instead of actively managed funds), and you might also have other mutual fund fees and transaction fees. If you want to reduce your fees even further, you can consider ETFs. ETFs are similar to funds, in that they represent a collection of investments, but they trade like stocks on the exchange. The transaction fees are often lower than even no load mutual funds. On top of that, some brokerages now offer ETFs with no transaction fees. You will have to pay expense ratios with ETFs, but these ratios are usually quite small. Indeed, the ratios on ETFs can be as low as 0.04%. Even many no load mutual funds can beat that low of an expense ratio. Before you invest your money, carefully consider your options, and choose an investment that works well for you. I partially agree with you. When one buys mutual funds they should look for no load funds but most Canadian MERs are quite high. I still buy mutual funds through our Group Plan and MERs are around 0.25%, almost as low as ETFs. I would otherwise look for ETFs. However, most brokers still charge commissions to buy ETFs. For new investors or those who don’t have/want a brokerage account mutual funds are their best option.